French Women Insurgents - June 1848 The involvement of Frenchwomen in popular insurgency dates back to the Middle Ages. The histor y of France since 1789 alone furnished many examples: in October 1789 women had marched to Versailles to bring back the royal family to Paris, and in the 1789 Revolution women's demonstrations against shortages of food and high food prices were often the catalyst for a moments' political upheaval. Nevertheless, inhibitions of gender, family and domestic cares meant that only a minority of women would play an active role in insurgency. By the early nineteenth century the pattern of female public prot est was, at the very least, changing. Michelle Perrot and Charles Tilly have suggested that the food, tax or Luddite riot that traditionally involved woman was disappearing by 1850 as a result of increased urbanization, mechanization and consequent specialization of function. Parallel with these structural changes went an increasingly conscious emphasis on the importance of a stable nuclear family and home, whose creation was to be focus the focus of women's essential energies. The modern left-wing politics that emerged in the 1830s and 1840s in France developed as a masculine affair. In spite of these unpromising changes, a few women nonetheless participated in the July revolution of 1830. 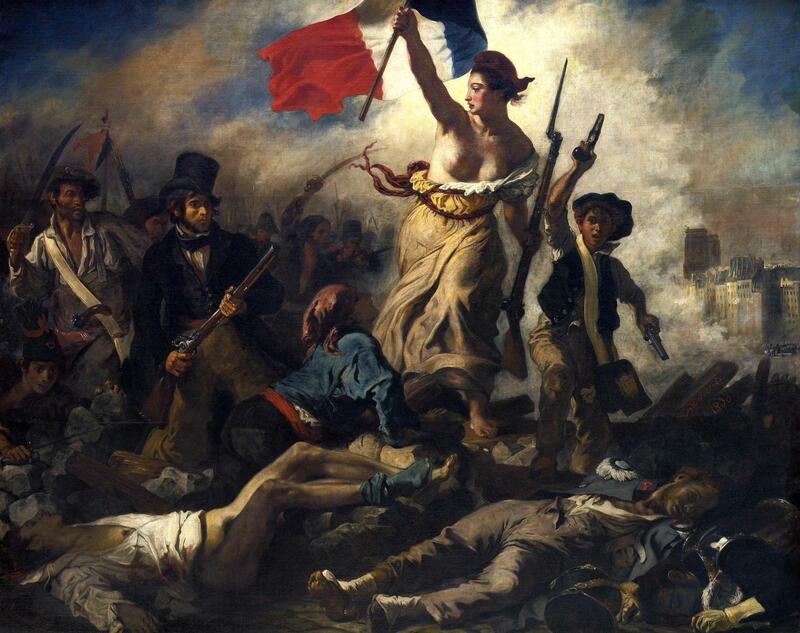 For instance, Marie Deschamps, a young working woman who fought on the barricades, was decorated by the state: her courage may have inspired Delacroix's painting of "Liberty guiding the people." There was likewise fleeting evidence of women actively invoked in the insurgency of February 22-24, 1848 in Paris. A woman named Adélaïde Bettrette, a dressmaker, was cited for state of pension after receiving a burn on the face while making gunpowder for the barricades during the February revolution. She had distributed arms to the men of her quarter, whom she summoned to march to the barricades. She herself helped to build barricades and had been one of the first people to raise the tricolor flag on them. Barbès and Chiron, a cook, accompanied her husband to the barricades of the Palais-Royal and wa s wounded there on February 24. Arsne Houssaye, in an article in L'Artiste, described an anonymous woman, "a Joan of Arc of the barricades," joining the invasion of the chamber of deputies on February 24, armed with a saber and asking to be introduced to Lamartine, the author of the Histoire des Girondins. Women's activism re-emerged in the June Days of 1848: a survey of the June insurgents by Charles Tilly and Lynn Lees found two hundred seventy three women among over eleve n thousand political detainees. Doubtlessly traditional concerns of protecting family, income, and the right to work motivated these rebels of June 1848 (though very few had been members of the national workshops). But evidence from judicial records suggested the presence of a more politicized awareness also. Geneviève Boulanger, a shoe-cord maker who appeared armed on the barricades of the quarter of the Marché Sainte Catherine, declared on June 24 that "in an hour, the rebellion would mak e the aristocrats dance" and that "Louis Blanc and Caussidière are at the head of the rising." Marie Chassang, a grocer at Belleville, declared that her quarter had taken up arms because of rumors of a royalist conspiracy on the left bank. A sense of grievance against the forces of law and order may have motivated others such as Elisabeth Guibal, a woodcarver, later noted by the police as displaying "most blameworthy conduct," who was wounded in the shooting on the Boulevard des Capucines on Februa ry 23, 1848 and became a state pensioner; in the June Days she was arrested for running about the streets, a saber in her hand, smashing shop windows to facilitate the seizure of arms. Other women were veterans of earlier insurrections, such as seventy six-year-old Veuve Henry, who led other women in the June conflict at the barricade of the Rue des Trois-Couronnes at Belleville. Though women formed a small minority of the June insurgents their role was not invariable secondary or supportive. Some went beyond Alexis de Tocqueville's description of their carrying the preoccupations of a housewife into battle and took the initiative in raising and organizing rebellion in their quarters. At Belleville, Joséphine Clabot, a pursemaker, was accused of having been continually on the barricades, armed and dressed as a man. This she subsequently confessed to, adding that she might return to the barricades. Witnesses described her as more relentless than her husband, a veteran of May 15 and the national workshops. Françoise Beaulieu, a washerwoman of the Quartier des Lombards, appeared on a barricade that she built with her husband, described as "the terror of the neighborhood." Mademoiselle Goden, a washerwoman, loaded the guns of their menfolk behind the barricades of the Faubourg du Temple. Other women rang the local steeple bell to rouse people to the barricades, forced shopkeepers and neighbors to produce cutlery and metal objects to be melted down for bullets, and smuggled arms or bread loaves. Women arrested after the June Days were interrogated by civilian examining magistrates, delegated by the army, who forwarded evidence to courts martial for sentencing. Women guilty of direct involvement in the rebellion were sentenced to transportation, although in practice this meant incarceration in St. Lazare, the principal women's prison of Paris. Some of the most troublesome women were subsequently removed to provincial prisons. Simone Leblanc and Catherine Leclerc, who by August 1848 had in no sense renounced their political fervor and were inciting fellow prisoners to rebel, were transferred from St. Lazare to prison at Haguenau in Alsace. In practice, the female insurgents of the June Days were all released before the end of 1849 and did not suffer the fate of men, who often served longer prison terms. Though most female insurgents of 1848 were skilled or unskilled workers, associated primarily with the clothing trade, a minority were petit bourgeois, such as wine-merchants who doubtlessly allowed their shops, which doubled as taverns, to be used for political discussion. A minority were prostitutes, whose lives in the early nineteenth century had become increasingly subject to bureaucratic harassment, and who relished a chance to retaliate against the forces of law and order or were drawn into conflict by lovers and protectors. Florentine Bacle, a prostitute, was convicted for having assisted her lover, Jules Bonvicini, a dentist of the Faubourg du Temple, in making bullets and cartridges for the June rebels on his premises. Following Louis-Napoléon's coup d'état on December 2, 1851, efforts were made to raise resistance in the eastern districts of Paris once more. Though abortive, these efforts again led to the arrest of a number of women (sixty three of 5,260 arrested in the area of the first military divisional command). Some were radical suspects (such as the teacher and feminist Pauline Roland) but in other instances there was definite complicity. Augustine Péan, a domestic servant, wounded on barricades she had helped to build, subsequently admitted her involvement. In 1851-52 sentences were harsher and number of women were deported to Algeria. Women insurgents reflect a division between moderate and radical feminists in 1848 and the gulf between French feminist aims and ideas in the France of the nineteenth century. A. Ségalas La Femme (Paris 1847). Mes Contemporains: Première Serie, Anaïs Ségales (Paris 1887). E. de Mirecourt Les Contemporains: Portraits et Silhouettes au XIXe Siècle: Anaïs Ségalas (3d ed. ; Paris, 1871). Francis Roch Revue Biographique des Célébrités Contemporains: Mme Anaïs Ségalas (Paris, 1854). Simone Leblanc and Catherine Leclerc, who by August 1848 had in no sense renounced their political fervor and were inciting fellow prisoners to rebel, were transferred from St. Lazare to prison at Haguenau in Alsace.